Birth date and place c. 1836 Liverpool, Lancashire, England. c. 1836. 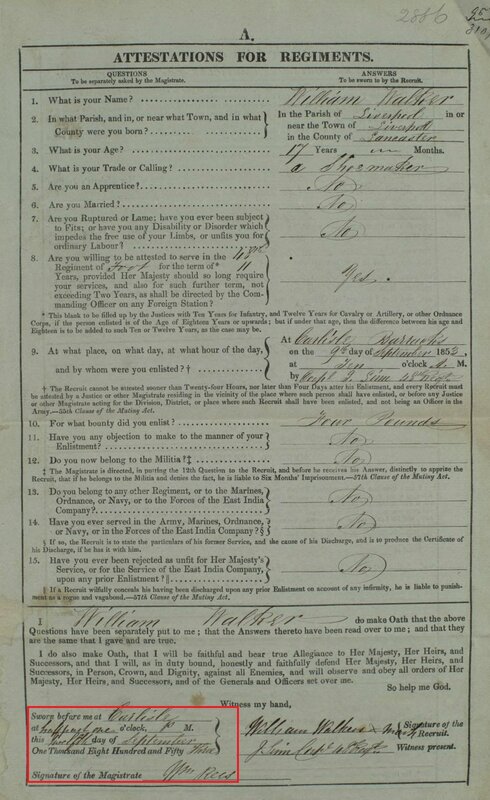 Army Attestation document (see sidebar) indicates 17 years in September 1853. (see sidebar) indicates 18 years 8 months in November 1853.
c. 1826. 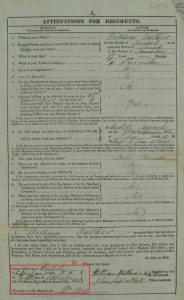 South Australian Death Registration transcription indicates 75 years on 15 August 1901.
c. 1832 Hindmarsh Cemetery record indicates 69 years on 17 August 1901. Physical Description Army Attestation: Height: 5 ft. 5 7/8 ins. Complexion: fresh. Eyes: hazel. Hair: dark brown. 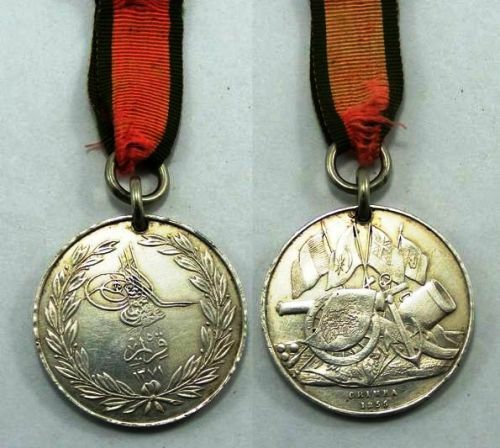 Army Discharge: Height: 5 ft. 5 7/8 ins. Complexion: fresh. Eyes: hazel. Hair: dark brown. 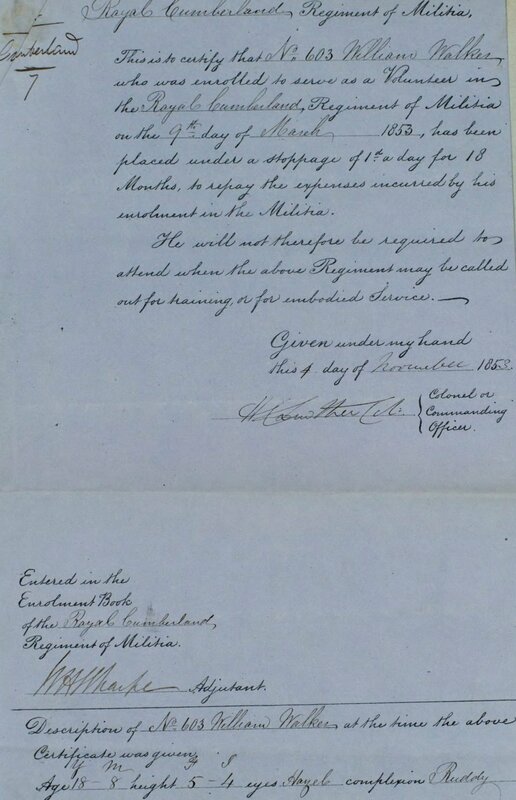 Militia Document: 5 ft. 4 ins. Complexion: ruddy. Eyes: hazel. Marriage date and place NOTE: All information relating to marriages and children is based on the people named Walker buried in the same gravesite in Hindmarsh Cemetery. 2nd: 9 Jan 1882 United Methodist Free Church, Adelaide, South Australia. Spouse 1st: Ann ? (died 14 Dec 1880 Brompton, South Australia). 2nd: Mary Jane TAYLOR (widow of Charles STRATMAN/STREETMAN). Children 1st marriage: James b. 1856 outside Australia, d. 1880, Hindmarsh, South Australia. John Hugh b. & d. 1883, Hindmarsh, South Australia. Susannah b. 1884 & d. 1892, Brompton Park, South Australia. Death date and place 15 Aug 1901 Taylor Street, Brompton Park, South Australia. Burial date and place 17 Aug 1901 Hindmarsh Cemetery, South Australia. Eastern Area, Row F, Grave 11. Death Notices and Obituaries The Advertiser 17 Aug 1901. Regiment No. and Rank #603 (Militia) Volunteer. 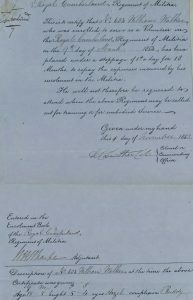 Attestation date and place 9 Mar 1853 (Militia). 12 Sep 1853 Carlisle Barracks, Cumberland (48th Regiment). Service/Campaigns Turkey & Crimea 10 months. Casualty/Medical Casualty Roll: Severe Wound. Second Battle of Inkermann. 5 November 1854. Disabled by contraction of right elbow and partial loss of power of forearm and hand after gunshot wound received at Inkerman. Humerus fractured above elbow. 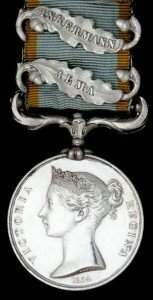 Unfit for the service [Chatham 23rd May 1855]. Discharge date and place 26 Jun 1855 Chatham. Length of Service 269 days. Post Discharge Pension District Carlisle (1855). 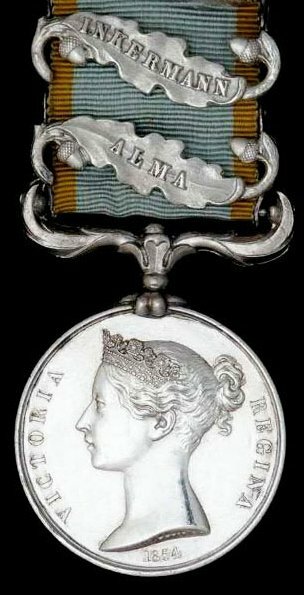 1st Edinburgh (1856). Carlisle (1857). Adelaide (1865). Misc. Newspaper Articles Perth Gazette 25 Aug 1865. 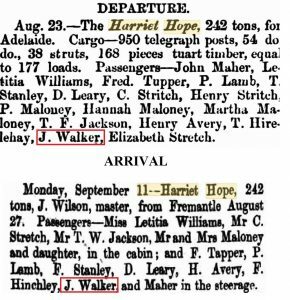 Wallaroo Times 13 Sep 1865. Departure from WA Harriet Hope (see sidebar, tentative). Dep. 23 Aug 1865 Fremantle; Arr. 11 Sep 1865 Adelaide. Recorded as ‘J Walker’. 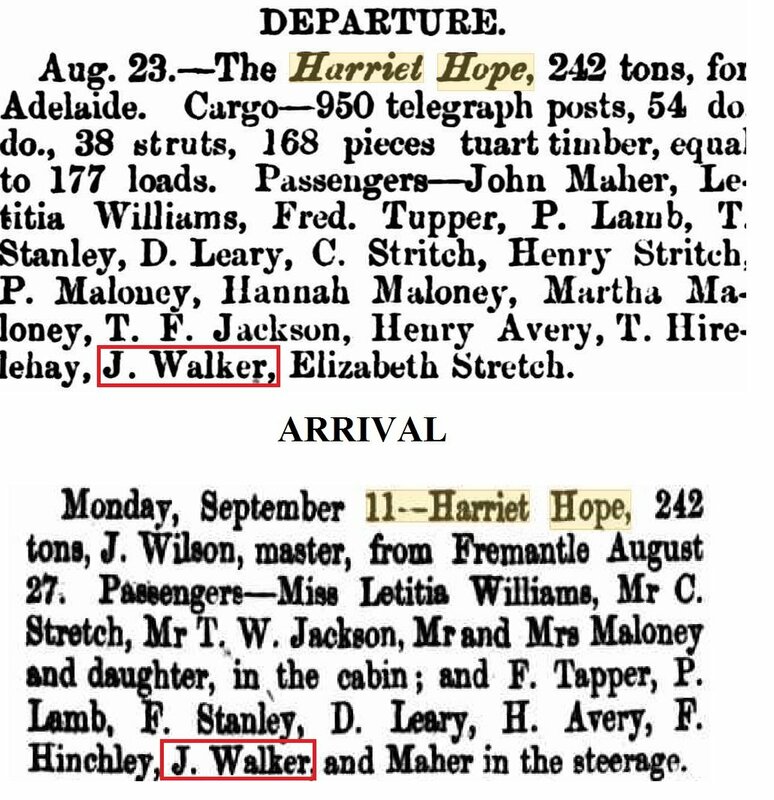 This could be an error for ‘W Walker’, or could be ‘James Walker’ (son) per children above.